Whether you have a prized grand piano or an organ that has been passed down to you from family members, the piano movers at All Around Moving & Storage can ensure that it gets where it needs to be in perfect condition. Our piano moving company specializes in taking great care of precious cargo of all types, including baby grands, uprights, concert grands, and spinets. Using the best in moving supplies, our team is able to relocate pianos anywhere in the world, and your satisfaction is guaranteed in all that we do. The professional piano movers at All Around Moving & Storage understand that your piano is not only an instrument, but it is also an expression of who you are. From professional studio pianos to cherished family heirlooms, our piano moving company will provide expert care during the entire relocation process. If you find that you need piano storage before, during, or after the moving process, we also offer a range of affordable and secure options. Before partnering with our professional piano movers, we suggest that you take some time to prepare your instrument for relocation. 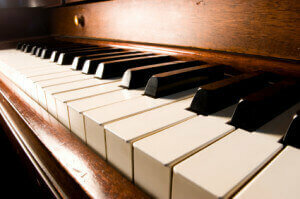 If your piano includes removable parts that will not change the condition of the piano by removing, take them off. If you find that doing so will potentially damage the instrument, let our piano movers take care of everything for you. Even in tight spaces, we can find a way to make things work. It’s also a good idea to tape or tie down any components of your piano that may come loose during the loading and transportation process. By securing these components, our piano moving professionals will be able to offer you faster, more efficient service. You should also ensure that your piano has been thoroughly cleaned, dusted, and maintained by a professional before relocating so that you will have peace of mind in knowing that the transportation process will not cause any additional damage. Keep in mind that All Around Moving & Storage also offers solutions for priceless pieces. To learn more about our professional piano movers and our piano moving company, contact All Around Moving & Storage by calling 734-941-2280.